Written by Regina Sanders. Media by Jason Wang. 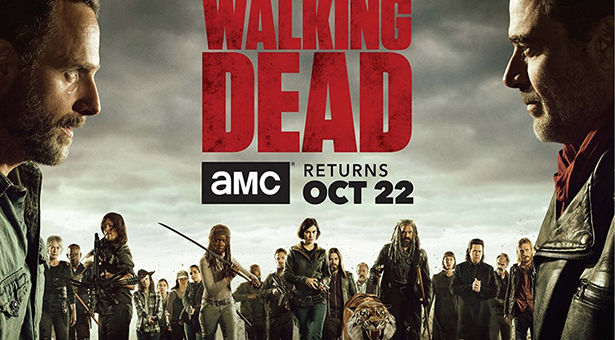 AMC’s “The Walking Dead” is one of television’s most anticipated fall returns. 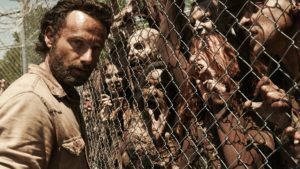 The show details the journey of Rick Grimes (played by Andrew Lincoln) and his group as they navigate the zombie apocalypse. For over seven seasons, fans have met and said goodbye to multi-dimensional and lovable characters. Viewers have witnessed the group learn how to survive in foreign terrain, redefine what it means to be human, and grow closer. During season seven, audiences experienced a roller coaster of emotions. They witnessed the deaths of several beloved characters, the defeated spirit of Rick and company, and the community’s eventual rise. 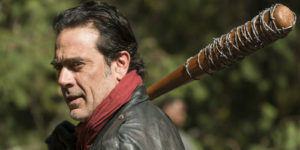 October 22, the season premiere and 100th episode, brings audiences back to Alexandria and the unavoidable war between Rick and Negan (played by Jeffery Dean Morgan). AMC pulled out all the stops with the promotion for its newest season of the fan-favorite show. In the ComicCon season trailer (above) Lincoln, as Rick Grimes, rallies his various communities (called Alexandria, Hilltop, and the Kingdom) with an inspiring speech to fight Negan (and his group called the Saviors). “With everything we’ve beat, everything we’ve endured, everything we’ve risen above, everything we’ve become—no matter what comes next, we’ve won! We’ve already won!” Lincoln states confidently. 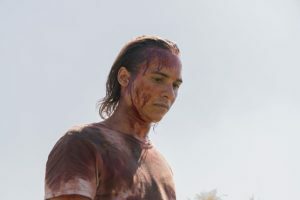 Until the October premiere date, fans have spin-off “Fear the Walking Dead” to tide them over. The prequel series, set in the same universe as “The Walking Dead,” shows how the world slowly recognized the zombie infestation, how one specific family handles this onset apocalypse, and provides an insight into events glossed over due to Rick Grimes’ coma during season one. This decision brings excitement and delight to longtime “Walking Dead” comic book fans. Antagonist Negan is known for his profanity-riddled sentences, often swearing every other word. One comment, after Morgan’s much-anticipated debut, was dismay over Negan’s lack of swearing. With permission to use the word twice, fans may come closer to a more accurate and faithful adaptation of Negan. As the zombie apocalypse continues to unfold and television continues to evolve, fans have a lot to look forward to. Catch both shows on Sunday on AMC, with “Fear” airing currently, and “The Walking Dead” set to air late October.